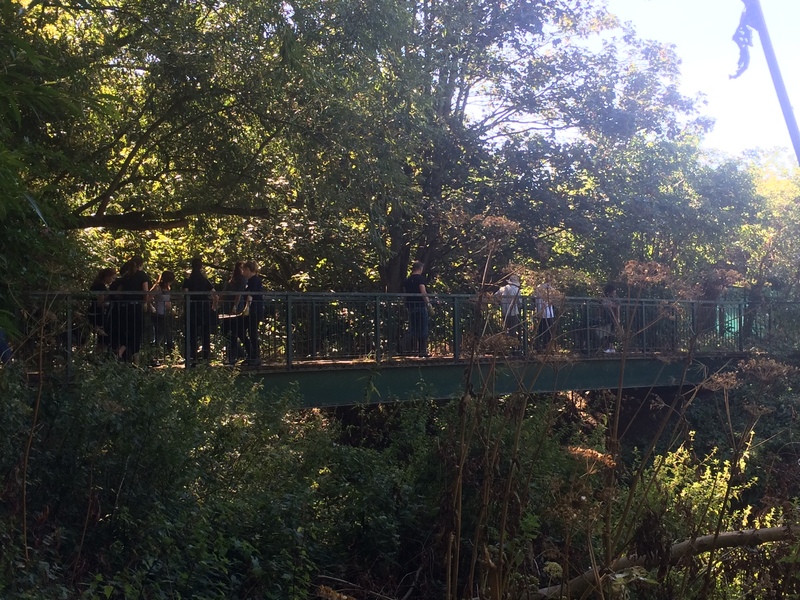 On a sunny, September morning 85 volunteers gathered at Wandle Meadow Nature Park on North Road in Merton for another Wandle cleanup. Yes, you read that right – 85!!! Why so many? Well our numbers were larger than normal we were joined by 25 fresh recruits from the Richmond International University. 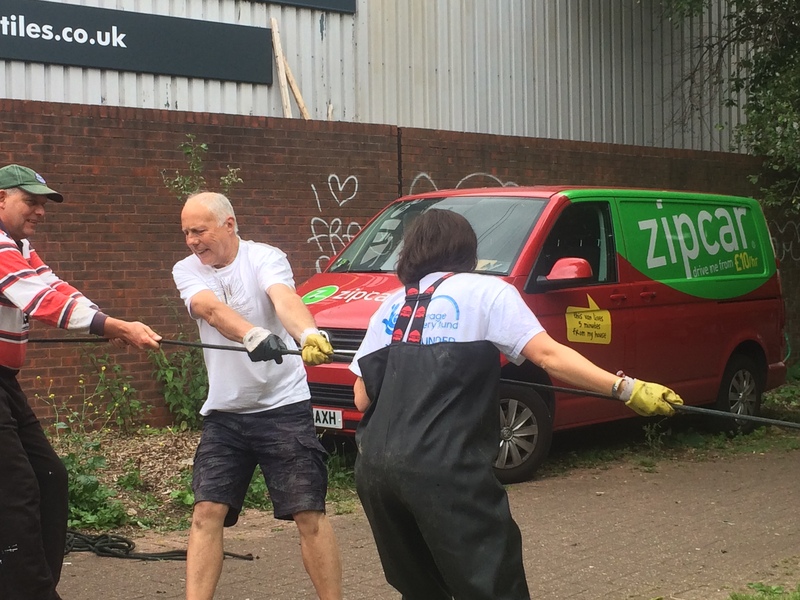 We were also lucky enough to have our ZipCar team again from last year, no floating pennywort for them to tackle this time though. After the safety talk, 85 of us got to work. We had a large wading team which headed right to the end of the park as with so many people we were sure we could cover the distance. 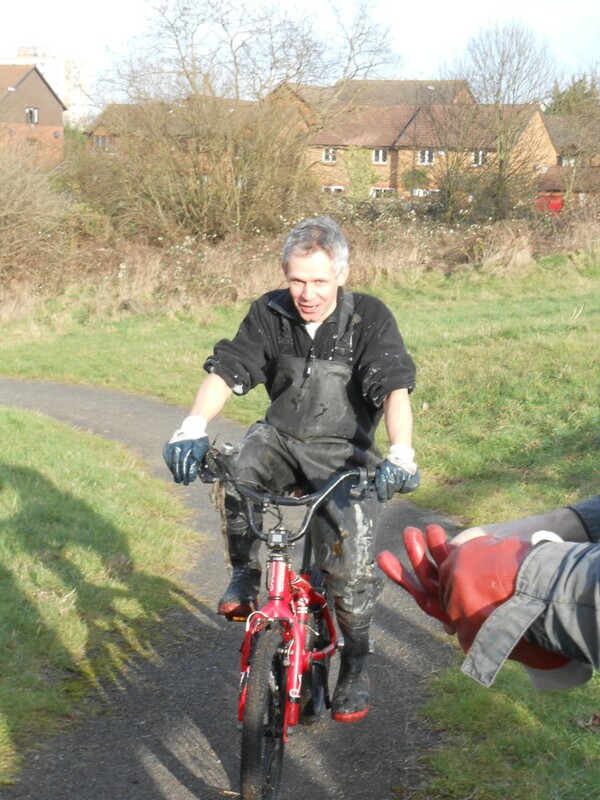 Once again, large amounts of rubbish started coming out but with plenty of hands on the bank we made light work of it. 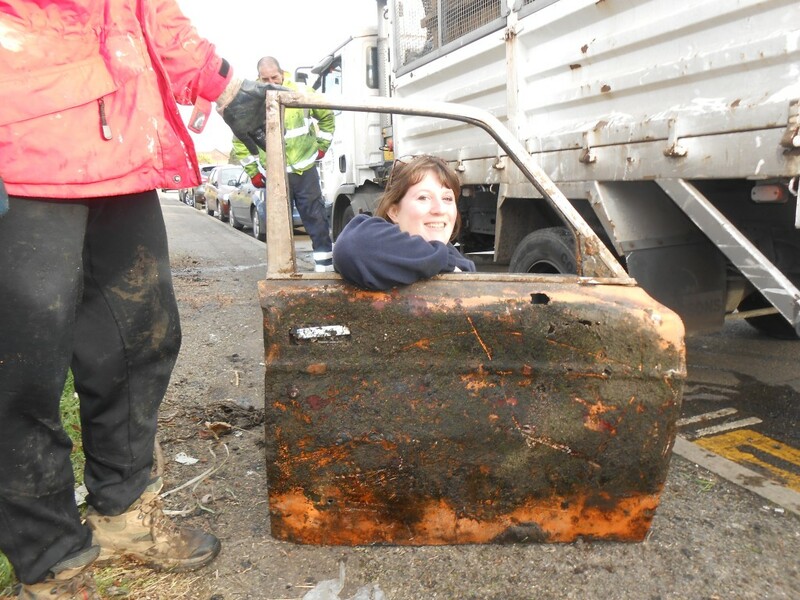 One logistical challenge was a large piece of metal which would not fit in a wheelbarrow. So a chain of 8 people took turns carrying it over the bridge to the rubbish pile, with all the other wheelbarrows of junk too. As we worked up the river, there was no shortage of rubbish. We found Iggle Piggle, lawnmowers, coffee tables and tyres. After lunch, we had to change our plan of heading further upstream due to the discovery of an aggressive wasp nest. So instead we headed back and gave the river a second sweep to double check we got everything. Which being the Wandle, of course we hadn’t! And sure enough, there was more to find. After covering the stretch twice we called it a day and started to pack up the van. Huge thanks to the Living Wandle Landscape Partnership for funding the event as part of the River Guardians projects, everyone who helped unpack and pack up the van during the event, Rosie for supervising the Event Tent, Wally for helping supervise the cleanup, and the Waste Team at Merton Council for organising collection of all the rubbish the next day. Thank you to all our volunteers for coming: Aaron, Abi, Alex B, Alex S, Andrew, Andy, Anya, Ben C, Ben C, Ben W, Berengere, Carol , Caroline, Charles, Chloe Chris E, Christine, Claire, Conor, Dave J, David C, David H, Derek, Diana, Dimal, Emma, Fumbi, Gearoid, ,Gemma, Guy, Ida, Jackie, Jay, Joanna, John, Kaia, Kaitlynn, Kamillah, Katelyn, Kaylee, Kevin, Kristina, Kyra, Leah, Louise, Madison, Mark, Mel, Merel, Michelle, Mike, Miriah, Nick, Nicki, Nina, Patrick, Peggy, Per, Reagor, Renah, Rob, Rory, Rosie, Sabina, Sally, Samantha, Samira, Shannon, Shela, Shelby, Si, Sophie, Steve B, Steve M, Stewart, Theo, Tom C, Tom K, Tony, Tyler, Wally and Wayne. Phew! So what did I learn from this month’s cleanup? 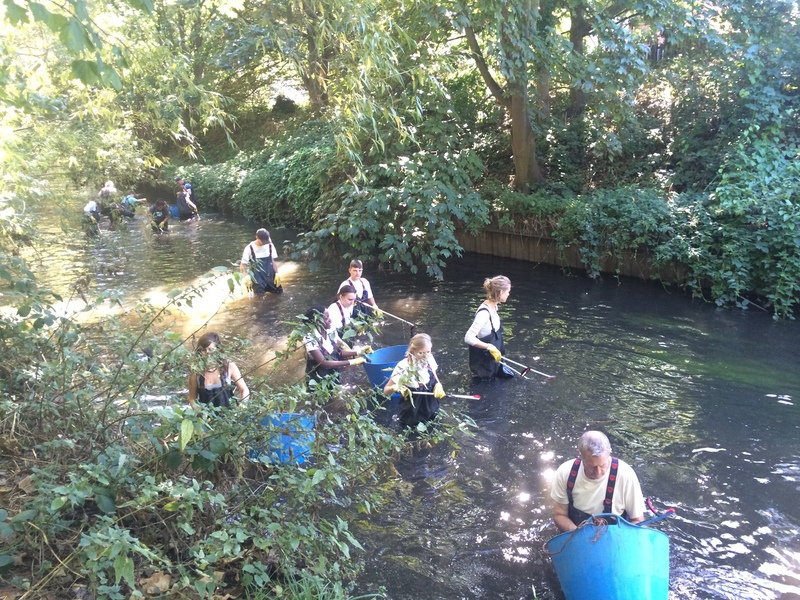 That you never know how many people will fancy joining a Wandle cleanup on the day. So prepare for 80…. This entry was posted in Uncategorized and tagged Cleanups, Events, HLF, Living Wandle Landscape Partnership, Merton, North Road, People, Spreading the Wandle Word, Wandle, Wimbledon on September 28, 2016 by Polly. 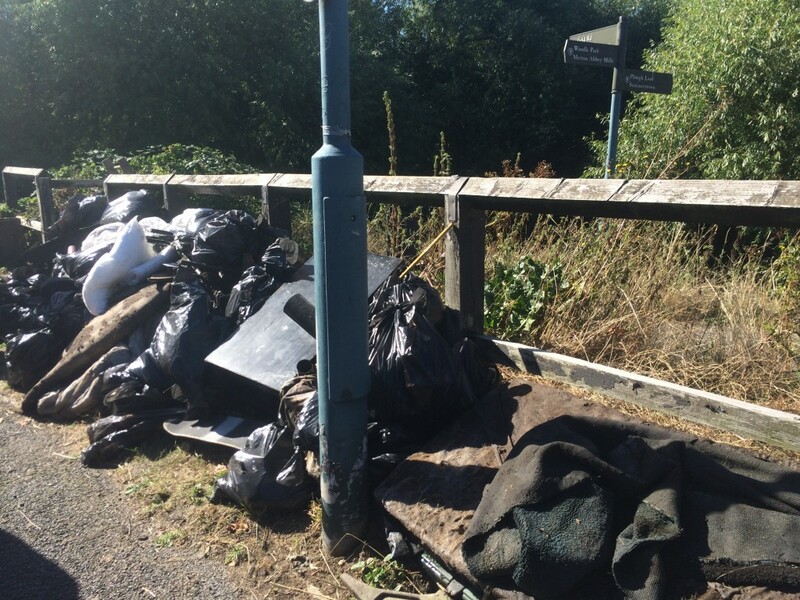 Over the last couple of years, I’ve got quicker at packing the van and better at navigating the Wandle Valley and as a result I have started arriving to the cleanups earlier than usual. When I arrive, or not soon after, there have been people slowly arriving. However the morning of this cleanup, no one was there. And no one appeared until 10:50 – by which point I was experiencing a meltdown, checking I had sent the email, and that I wasn’t in the wrong place! But in that 10 minutes, everyone appeared and we got started as usual. Phew!! 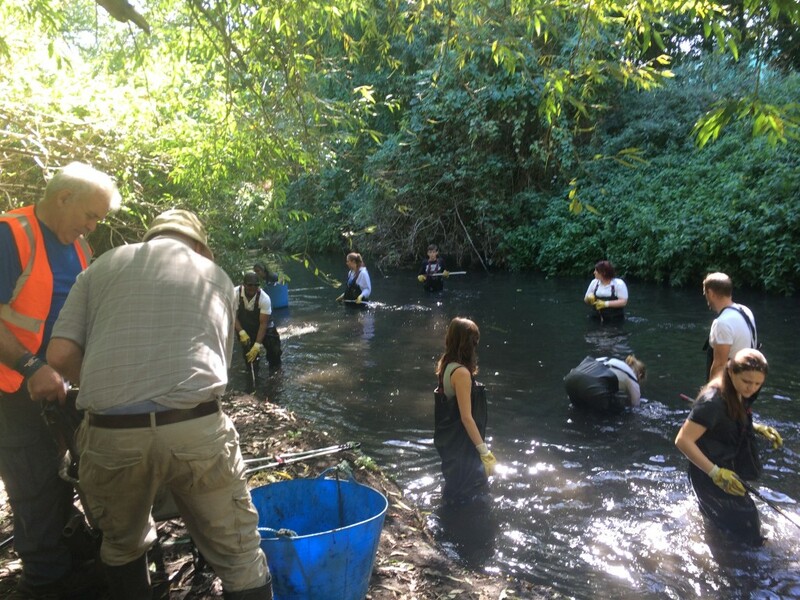 The event was funded through the Living Wandle Landscape Partnership, a HLF funded scheme all about reconnecting people with the River Wandle. 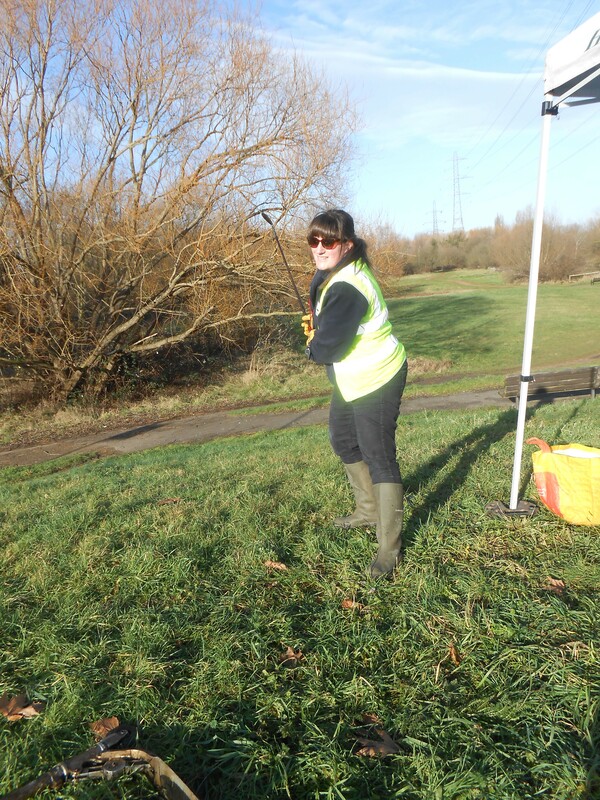 This time, we were even joined by Louise, a team member from the Living Wandle crew! After the Health & Safety briefing, we got stuck in. 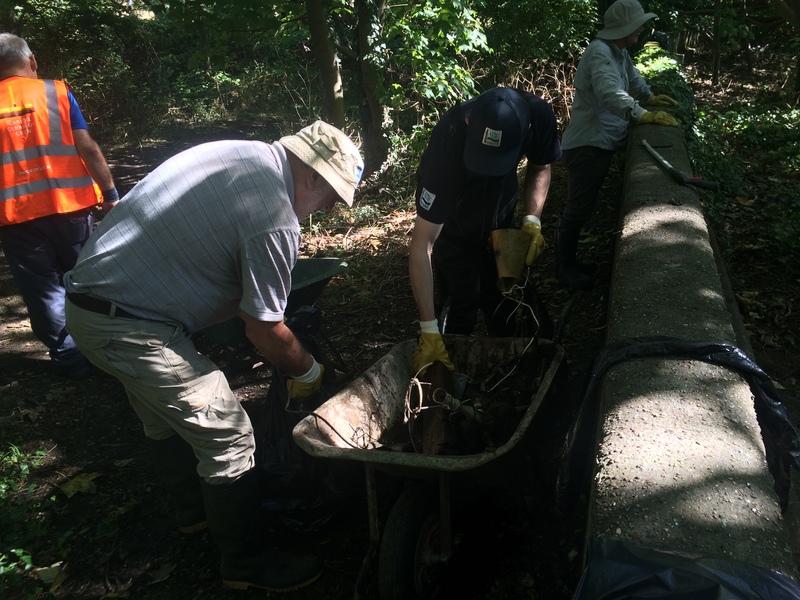 Firstly our wading team got into the river and headed downstream to Plough Lane Bridge. This small section is often missed on our usual cleanups as it has difficult access for bank support to heave the rubbish up and the waders have to go back on themselves to reach it. However, it clearly needed some attention! The small stretch was full of rubbish, some of it buried in the silt and some new fresh items which might have been washed down in the recent high flows. Either way, trug after trug were filled with Theo and myself heaving them up the concrete side. 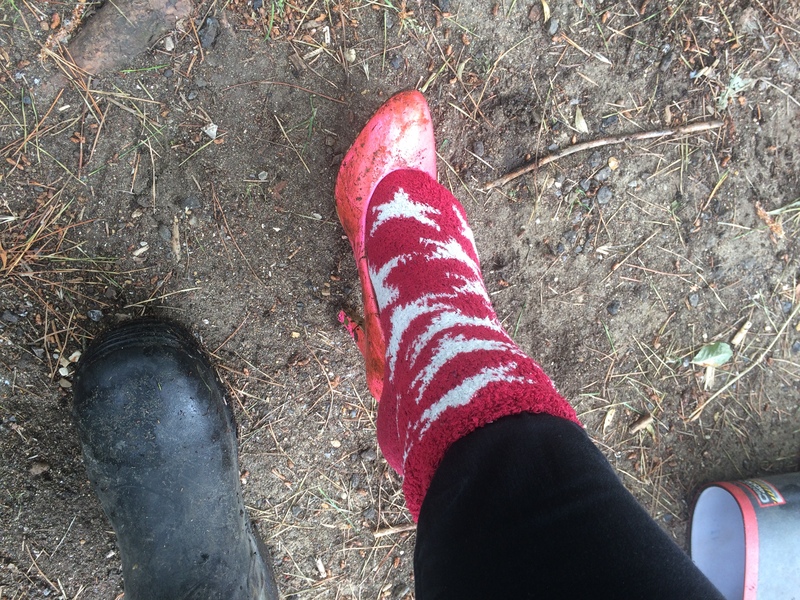 It didn’t take long until I was presented with my first gift from the cleanup – my Wandle slipper. It didn’t fit, which I suppose makes me the ugly sister, but I asked everyone to keep an eye out for Prince Charming just in case. One thing we were seeing a lot of were car carpets, we must have pulled out one in every trug load. On top of this, full carpets were being found, and duvets, all of which were extremely heavy having soaked up Wandle water and silt. A great work out for the arms, who needs a gym? It was soon lunchtime and we were all thankful for the break. As we drank our tea and ate our cake, we started discussing plans for the washing machine we had found earlier that morning. 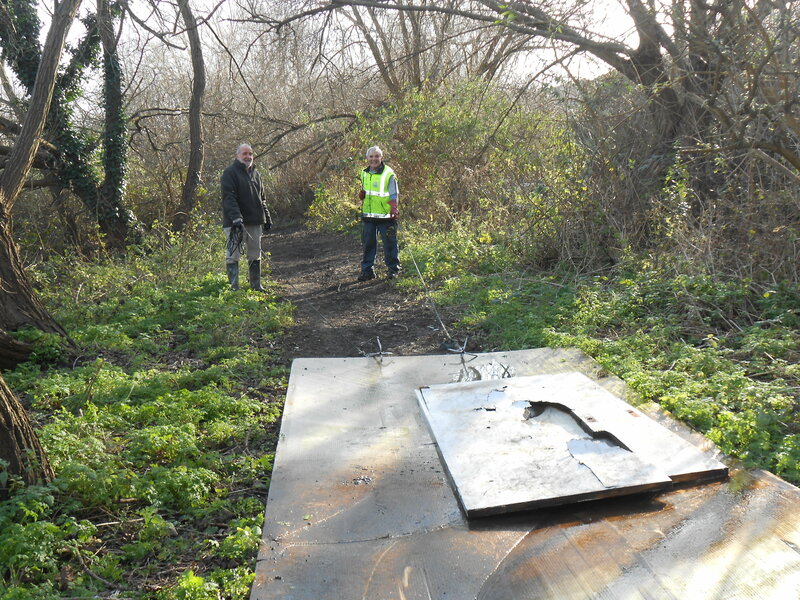 It was heavy and was at the difficult end of the site with a concrete bank between it and the rubbish pile. So we hatched a plan. Once lunch was over, Andy, Phil, Guy and Ed got back in the river and attached the grapple ropes to the washing machine. Everyone else, and I mean everyone else, gathered on the bank with the ropes and pulled like a well-oiled pulley machine. 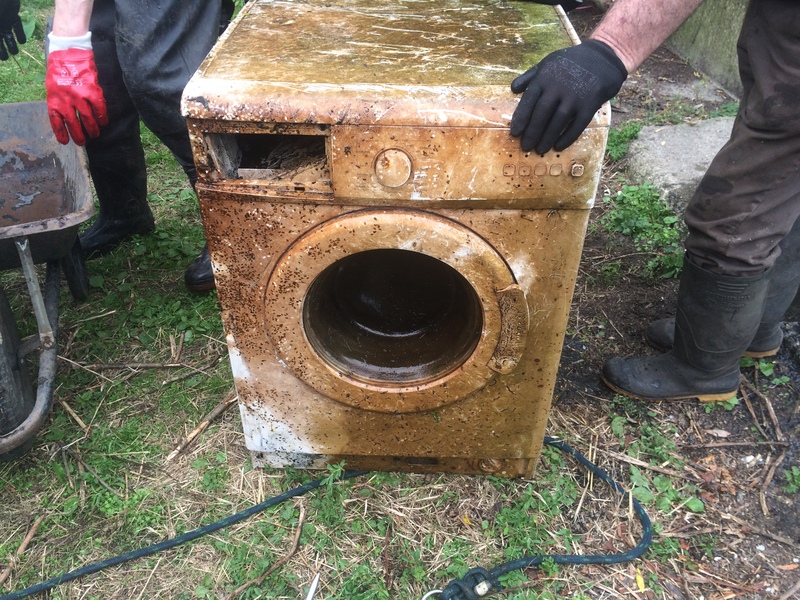 We got the washing machine to the top of the bank, but it became stuck under the concrete ledge. 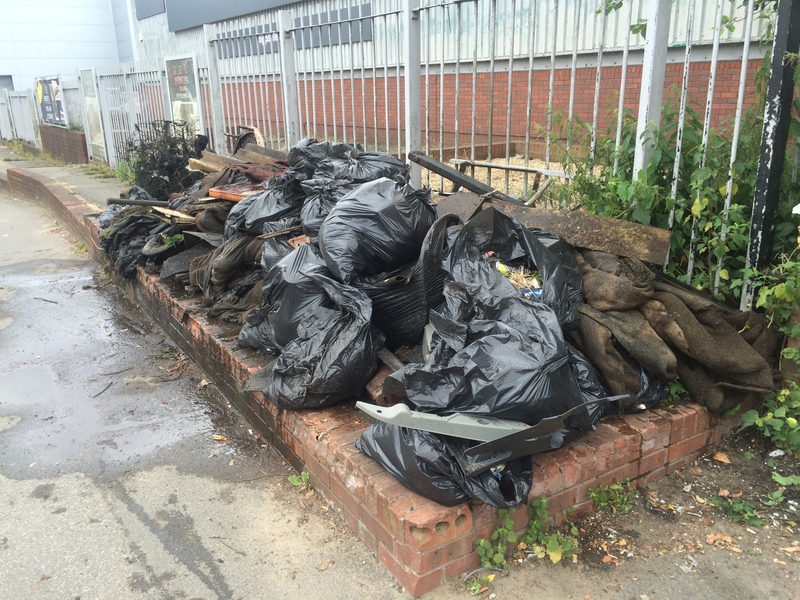 Luckily a final injection of muscle allowed us to lift it up and over and drag it to the rubbish pile. 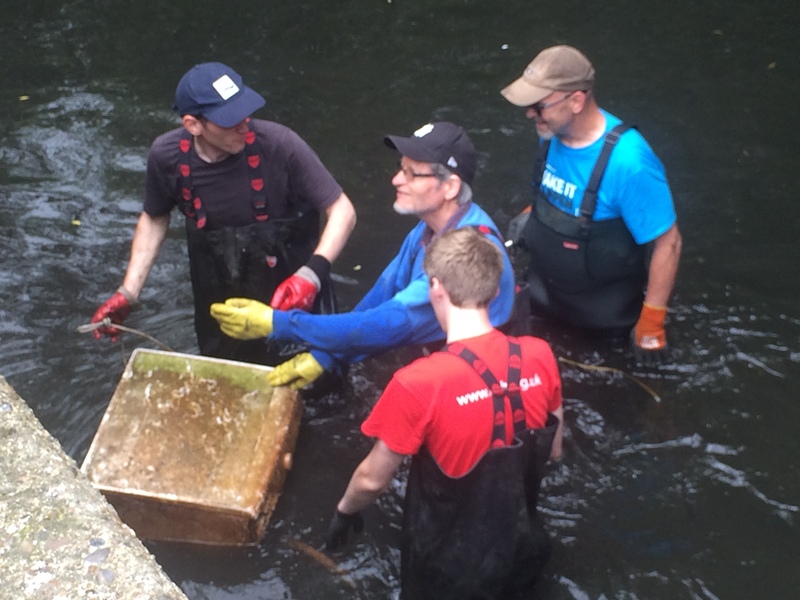 With that excitement over, everyone got back in the river and we started working upstream filling yet more trugs. By the end of the day the rubbish pile was huge and everyone was very satisfied with their work for the day. Time to go home, catch the end of Murray’s game and prepare for the football. So what did I learn from this month’s cleanup? 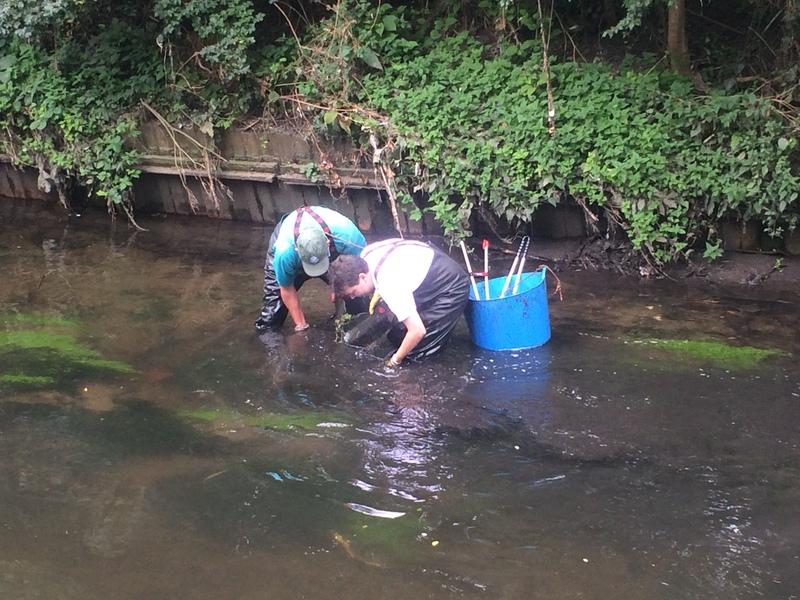 That even if it is the men’s Wimbledon final, people still would rather come and clear up the Wandle! 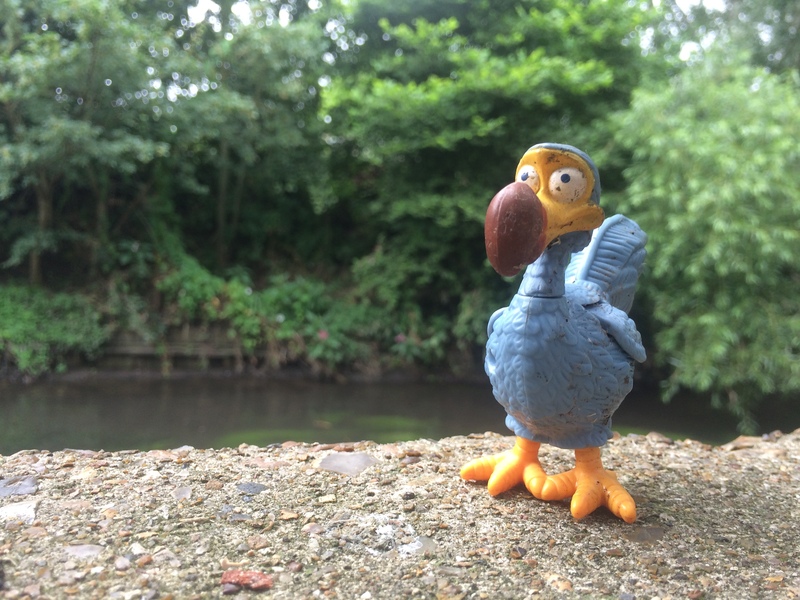 This entry was posted in Uncategorized and tagged Cleanups, Events, Living Wandle Landscape Partnership, Merton, People, Plough Lane, Spreading the Wandle Word, Volunteer, Wandle on July 14, 2016 by Polly. 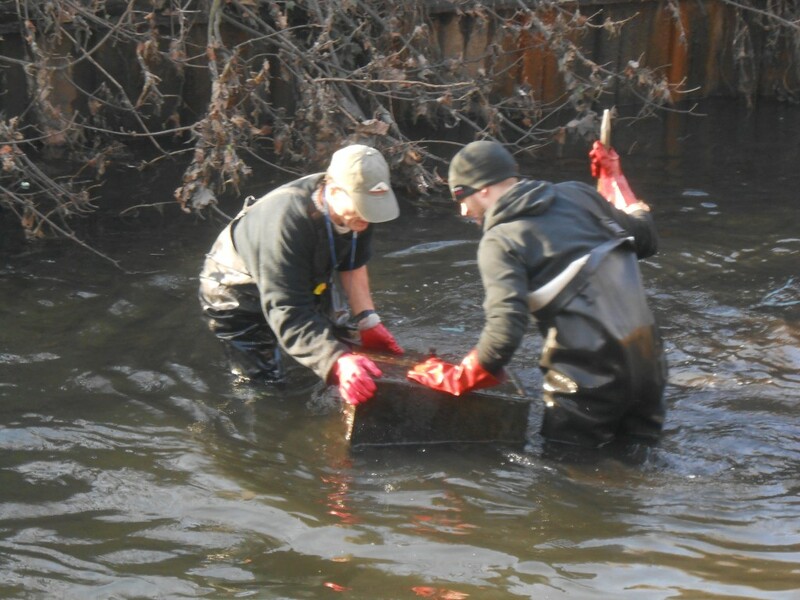 With Sunday 11th bring the second Sunday of January – it was time for the first Wandle Trust cleanup of 2015. 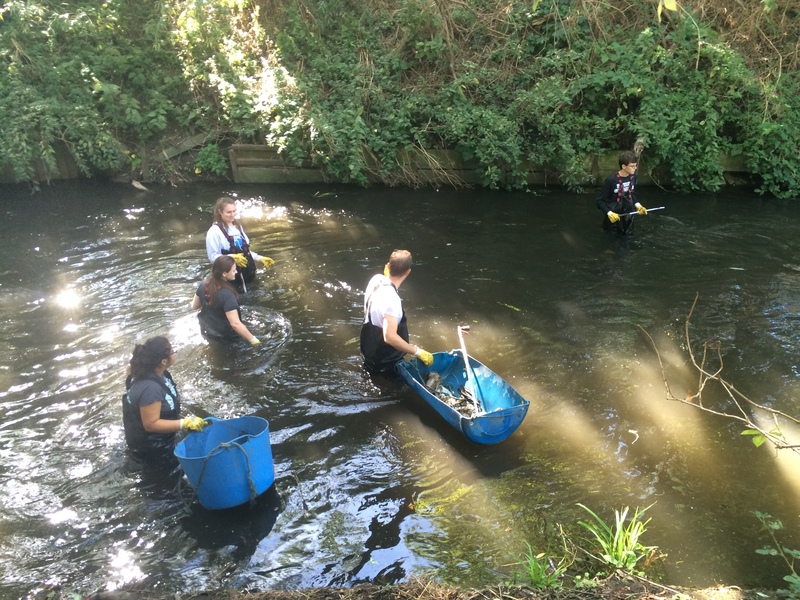 Last year, we pulled out 8.5 tonnes of rubbish from the River Wandle – and we are keen to break this record in the next 12 months. We started 2015 in Merton on North Road and as usual we got started after a Health & Safety briefing. 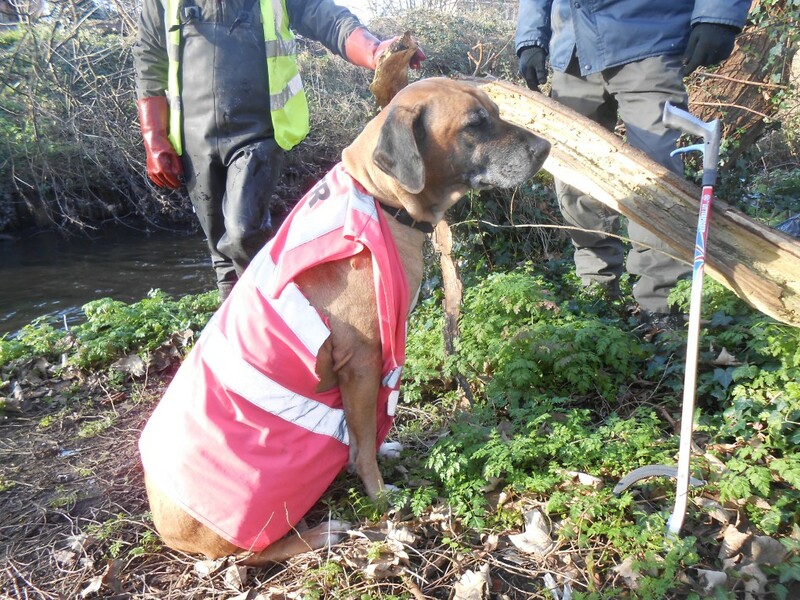 We had 38 volunteers with us on a sunny but chilly Sunday morning – as well as our faithful supervising dog, Basher. 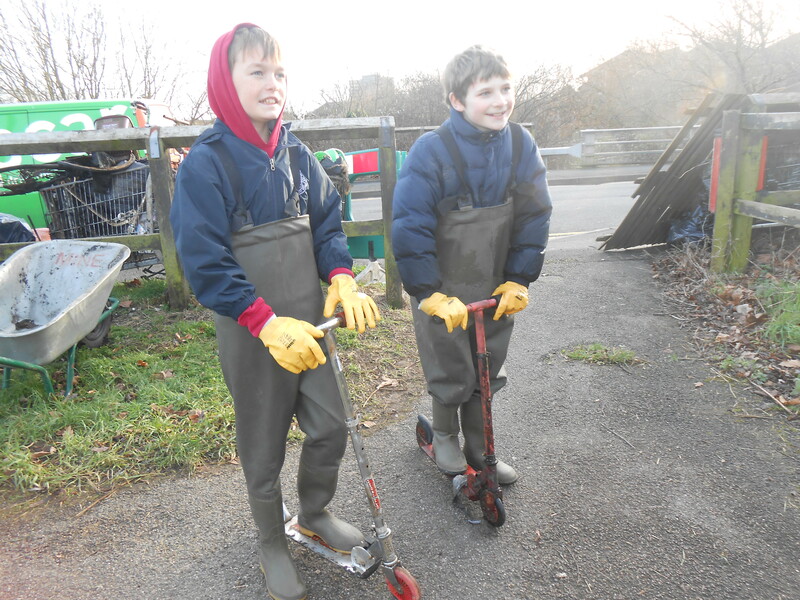 We split into two teams – waders and litter pickers. 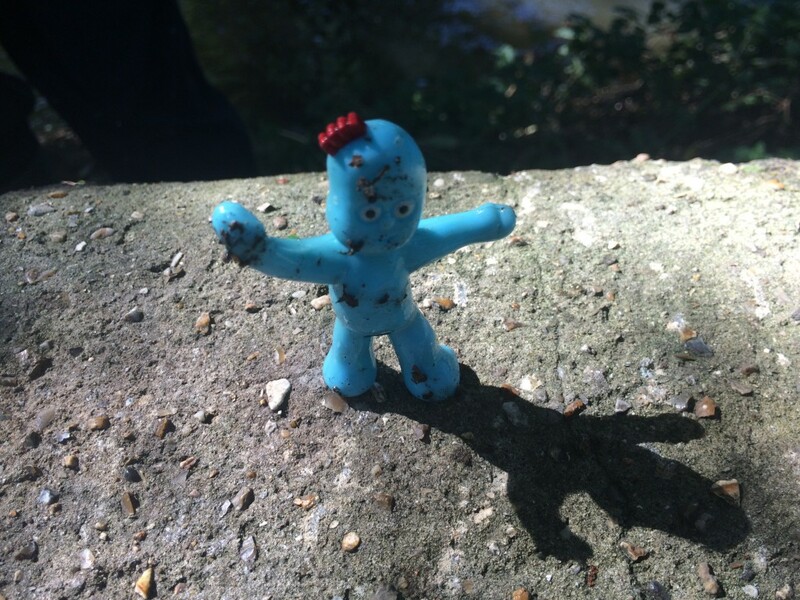 Our wading team hopped in the river and worked upstream finding all sorts of rubbish. It didn’t take long before they scouted out some “challenges” including a buried water tank which took grapples and some serious muscles to heave out of the river. Soon our litter pickers returned having scouted out the park and surrounding area. 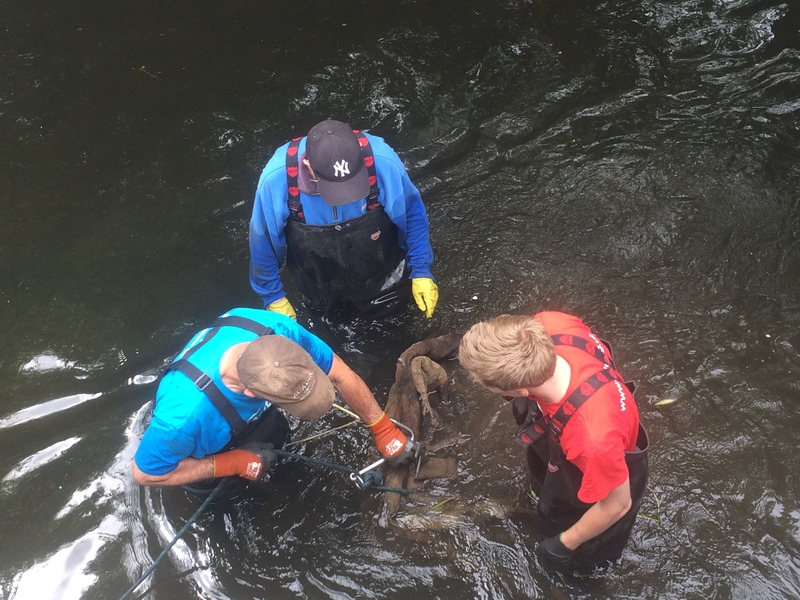 They had discovered 3 trolleys further upstream and a giant piece of plastic roofing wedged by a tree downstream; both of which our wading team just couldn’t resist! 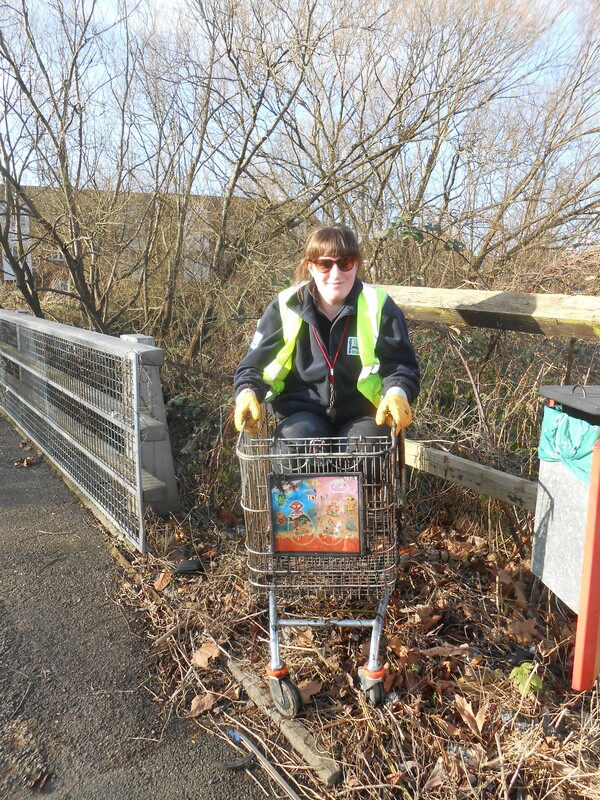 The trolleys were relatively simple – muscles and grapples – with all three trolleys in relatively good nick so we could push them (or hitch a ride in them) back to the rubbish pile. The plastic roof sheeting was another story. 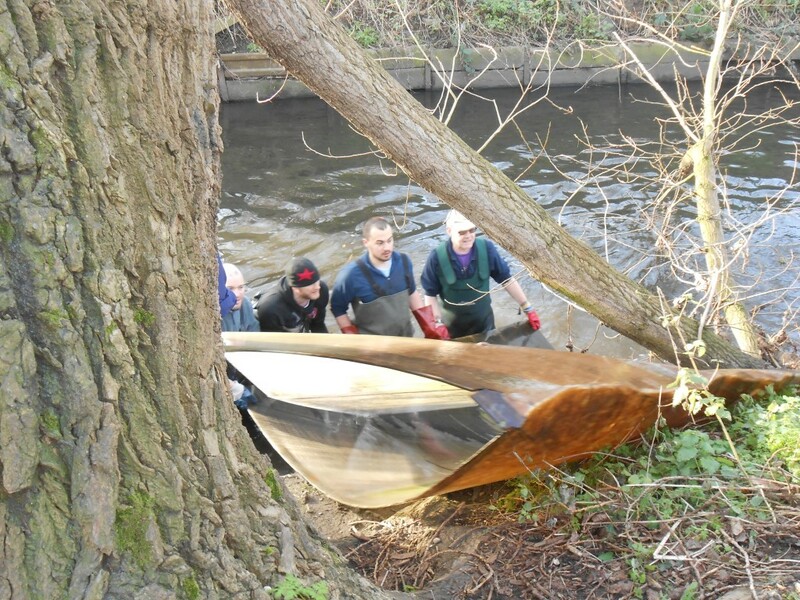 Roughly 3 metres wide and 5 metres long, the sheet was awkward and heavy to pull out of the river and disentangle from the undergrowth on the banks. However once free, all it took was a couple of huskies to pull the sheet back up the hill to the rubbish pile. Woof woof! After hauling this sheet up the hill, we decided everyone deserved a break so we all gathered back at the tent for cheese scones and hot tomato soup kindly supplied by Sally and Jana. Many many bicycles – including one which was so new, we rode it back to the pile! 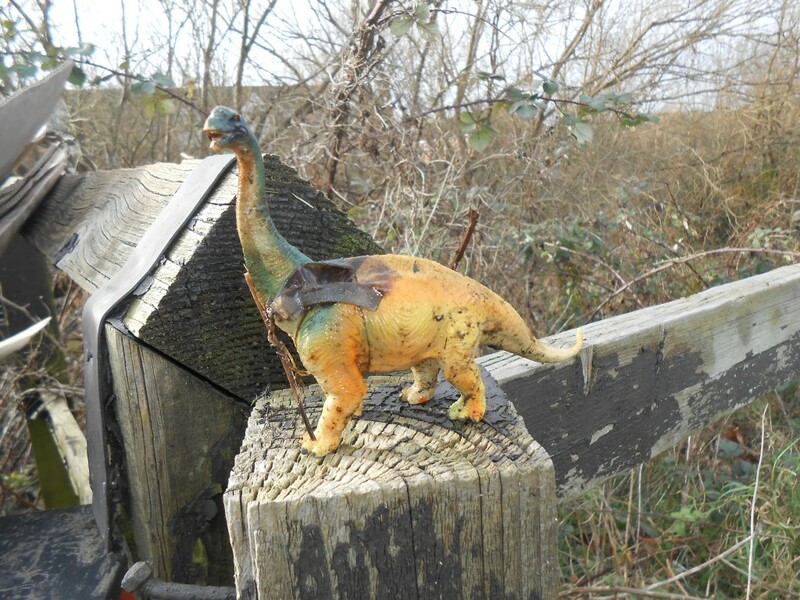 and a toy dinosaur – I always have to find a toy. 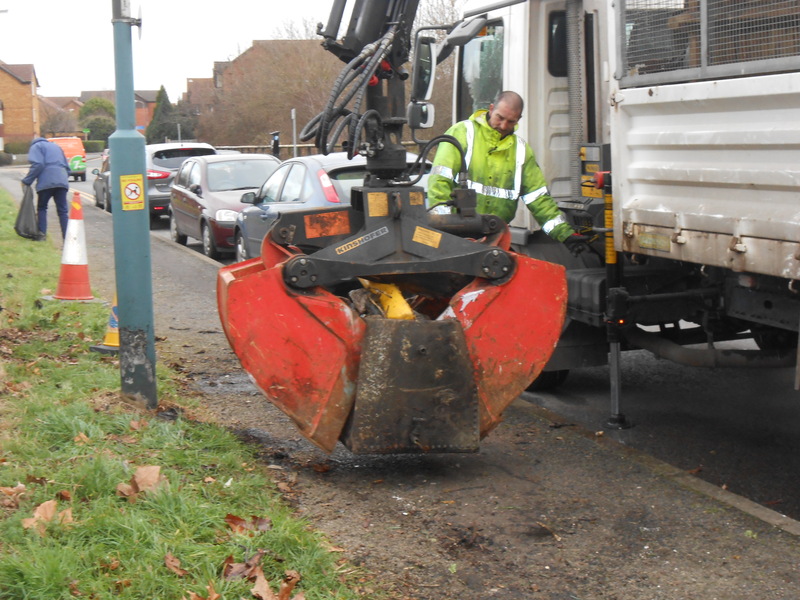 At half two, Stan from Merton Borough Council appeared with the grabber lorry to collect the rubbish causing a stir of excitement back at base. We got to see the grabber in action as it crushed our metal water tank as if it were made of paper. So what did we find? 1 wheelchair, 1 leaf blower, 1 giant plastic roof sheet, 1 plastic dinosaur, 1 vacuum cleaner, 1 water tank, 1 car door, 1 frying pan, 1 bucket, 1 petrol tank, 1 orange, 1 lemon, 1 pineapple, , 1 half coconut shell, 2 traffic cones, 2 barrels, 4 tyres, 7 scooters, 7 bicycles, lots of carpets, miscellaneous piping, bags and bags of other junk. Huge thanks to Gideon and Michael who met me early to load and unload the van; Sally and Jana for catering for our 38 volunteers; Theo and John for helping supervise everyone on the day; to the Waste Management Team at Merton Council for organising collection of all the rubbish on the day. Thank you to all our volunteers for coming: AJ, Bella, Bertie, Charles, Chris E, Chris L, Claire, Dave, David, Derek, Elliot, Felix, Gerald, Gideon, Guy, Harry, Jamie, Jana, Jane, Jason, John, Keith, Mark, Matylda, Michael F, Michael H, Ollie, Penny, Richard, Sally, Stewart, Theo, Tim, Toby and Wally. So what did I learn from this month’s cleanup? 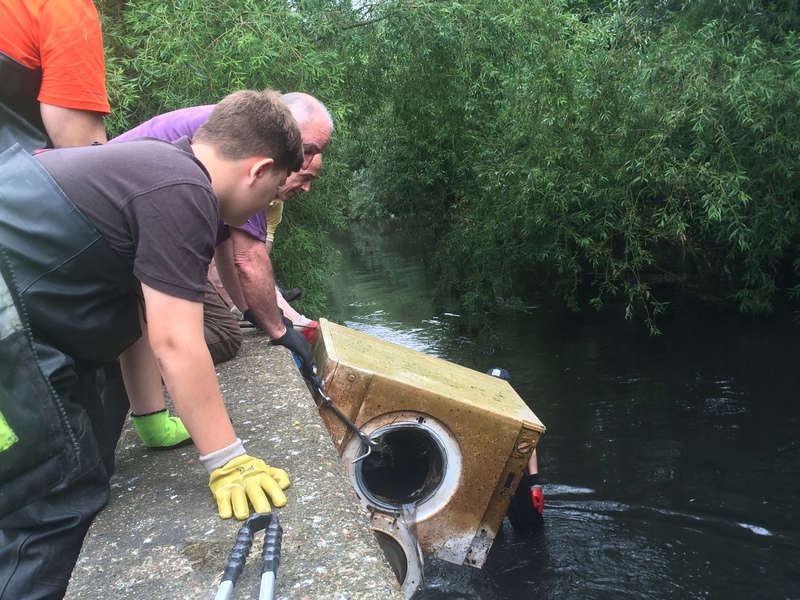 That even if it looks like there is little rubbish in the river, the Wandle volunteers will somehow find enough to fill a lorry! 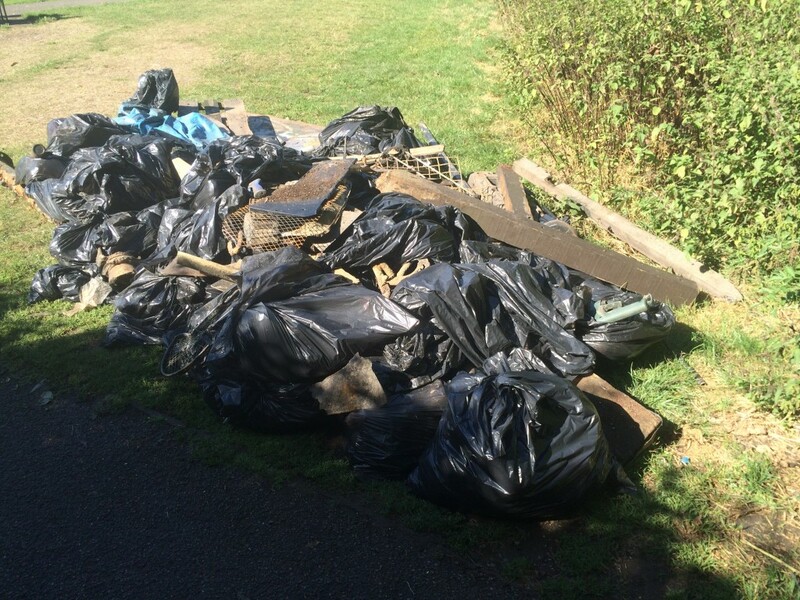 This entry was posted in Uncategorized and tagged Cleanups, Events, Merton, North Road, People, Pollution, Spreading the Wandle Word, Thank you, Wandle on January 19, 2015 by Polly.